Building off of a trailer released on Wednesday, the developers of The Division delivered an impressive livestream yesterday that shows that the game’s free 1.8 fall patch may be the best for players who are into combat in the game’s open world. Some changes to how combat unfolds were especially encouraging. The full livestream is viewable below, with the tour of the update’s new West Side Piers pair of zones starting at 11:54. The new area is an extension of the game’s existing map, but it functions under a different ruleset. As demonstrated in the stream, players are regularly being alerted to events happening in the new zones. The events seem to involve some basic actions, like needing to clear out enemies from a specific area or defend a landmark, but the idea is that players will keep getting alerts that pull them to new skirmishes across the zones. As players run through the West Side Piers sectors, enemies will spawn dynamically, with 1.8's developers suggesting on the stream that players will at times feel like the AI is trying to gank them. During the stream, for example, an enemy popped up from the roof of a truck, shooting down at the players. The new system underpinning West Side Piers also doles out new assignments to players. Examples given during the stream involved things like killing 15 enemies with a sidearm or killing 20 enemies within 10 meters. These would be like daily assignments, the developers said, but will generate every 15-20 minutes. Completing these actions and assignments will dole out Division Tech, a resource previously accessible in the game’s treacherous quasi-PvP Dark Zone area. The developers say it’ll be used to upgrade player’s gear in some way, making all of these loops worth it for players who want to get some sort of statistical improvement. If you’re less into stats and more into story, they’re promising that a fresh batch of audio logs will in some way expand the game’s story. 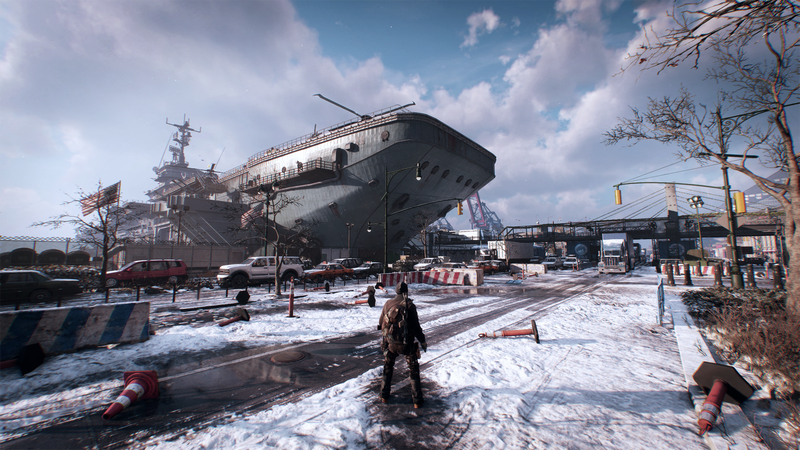 The new zone and its systems are being developed by Red Storm, the U.S.-based Tom Clancy game studio that’s worked on other aspects of The Division. Their artists have done an admirable job, as the stream showcases several impressive-looking points of interest, including a car wash, a nightclub (with aquarium floor), a mass grave site and the massive USS Intrepid aircraft carrier. A little hard to see in a cap from the stream, but the fish under the nightclub floor do swim. It sounds like the Intrepid will mostly be used for 1.8's horde mode, which is called Resistance. That mode wasn’t shown in the stream, but the developers did say that it will be solo-able if players desire. The new patch is also set to add a 4v4 multiplayer mode called Skirmish and some sort of change to the game’s promising but moribund Underground expansion. Details on that and anything else in 1.8 will likely be shown in future Division streams. They run at 11am ET on the game’s Twitch channel every Thursday. There’s no release date yet for the 1.8 patch. The developers are still making it and still working out some lingering issues with the recently-issued 1.7.